Two prominent aspects that brides and grooms find attractive about planning an outdoor Tahoe wedding – other than having a wedding site that consists of impressive natural surroundings, of course – is the simplicity of arranging for the wedding venue in addition to the affordability of hosting their event in the open air. Though many private areas and beaches can be costly, there are several wedding locations in Lake Tahoe that are inexpensive and can be acquired simply, which greatly facilitates efforts to join in matrimony and avoid much of the complexities associated with wedding planning. If you know where to search, you’ll find that there are a few public beaches and parks in Lake Tahoe accessible for weddings that don’t require booking, and, in some cases, a permit either, making it convenient and economical to conduct a ceremony in a beautiful area. This is a particularly great benefit for couples who plan a very brief engagement or for those who decide to move their marriage date forward and find it necessary to obtain a location on short notice. This can be a difficult chore if the wedding is to take place at an indoor facility or wedding hall where reservations usually need to be made far in advance, especially when trying to schedule the occasion during the summer months when wedding season is in full blossom. Furthermore, depending on the amount of guests that will be attending your event, if a permit is necessary to conduct a wedding at one of these select locations, the cost for acquisition of it oftentimes is negligible. Low permit fees make it possible to obtain a reasonably priced venue, and, as previously mentioned, under certain circumstances a permit may not even be necessary altogether. 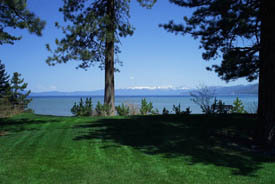 The wedding site at Regan Beach Park, for example, is a beautiful beach area in South Lake Tahoe where weddings occur throughout the year. For very small parties consisting of just a few guests, weddings on the beach can be hosted without a reservation, and possibly without a permit depending on the time of year and your circumstances. In essence, the cost of your wedding venue could possibly be free and can be obtained on a moment’s notice without any compromise of the natural beauty that abounds at more costly locations. 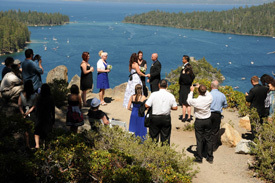 Emerald Bay and Logan Shoals, also found along the south shore of Tahoe, are similar examples of existing outdoor wedding sites that are available without prearrangement and have minimal permit fees. If a destination wedding is on your mind with the desire to have a cost-effective, simplistic ritual, an outdoor Tahoe ceremony is a worthwhile plan. It’s a perfect option for the marriage potentials that are pennywise and prefer a way to exchange their vows at a bargain price while simultaneously avoiding the hassles of complex planning, all without concession of quality of venue on a very special day. Simple Tahoe weddings in the outdoors occur around the lake throughout the year, and there are many local wedding coordinators that can assist you with planning your upcoming event. Give our friendly staff a call today or view our website for various wedding location ideas. 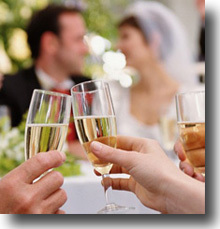 Or, for more tips about Tahoe weddings, visit our blog containing informative wedding articles on a variety of topics. 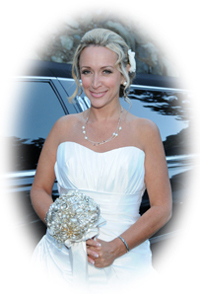 This entry was posted in Lake Tahoe Weddings, Wedding Tips and Ideas. Bookmark the permalink.